When a skin cancer is removed from the ear or nose, the remaining defect may be deep enough to involve the cartilage below. Cartilage is the stiff, supporting structure which creates the shape of the outer ear and nose. When a portion of this cartilage is removed, it often needs to be replaced in order for the structure to maintain its previous shape. When cartilage grafting is required, a donor site is first selected by choosing an area that will remain inconspicuous and has the appropriate shaped cartilage. Cartilage grafts may be harvested from the nasal septal cartilage, ear cartilage, or the costal cartilage of the ribs. If the ear is being repaired, the graft is often taken from behind the ear. 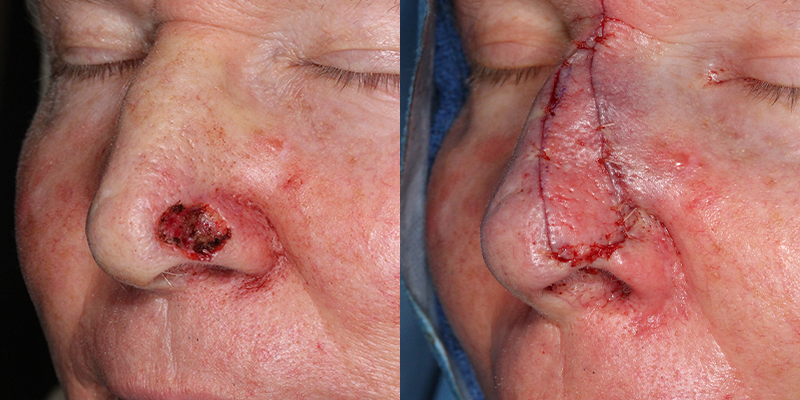 If the nose is being reconstructed, the graft would most likely be taken from the nasal septum, which divides the nasal passages. Small pieces of cartilage are taken from the donor site and custom shaped to recreate the missing structure which was removed.The grafts are strategically placed and secured like a framework beneath the skin until the desired supporting structure is achieved.The reconstruction of the overlying skin is then completed.